As an Alice in Wonderland fan, one of my fav quotes from Alice: "But if I'm not the same, the next question is 'Who in the world am I?' Ah, that's the great puzzle!" 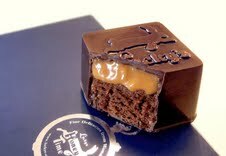 I was quite attracted to these Wonderland inspired mini honey cakes and brownies by UK based Lucky Chocolate. 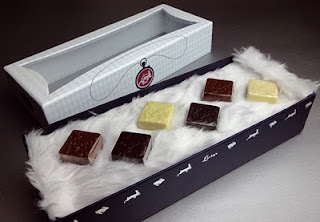 The mini cakes are handmade and coated in Grand Cru and Valhrona chocolate and individually packaged in their own box - so each one is almost like a little treat or gift. Their larger gift boxes are also fun, like the Honey Time Gift Set with 'rabbit fur' which includes collections of their larger Mad Hatter Bars. "It was much pleasanter at home, when one wasn't always growing larger and smaller, and being ordered about by mice and rabbits!"